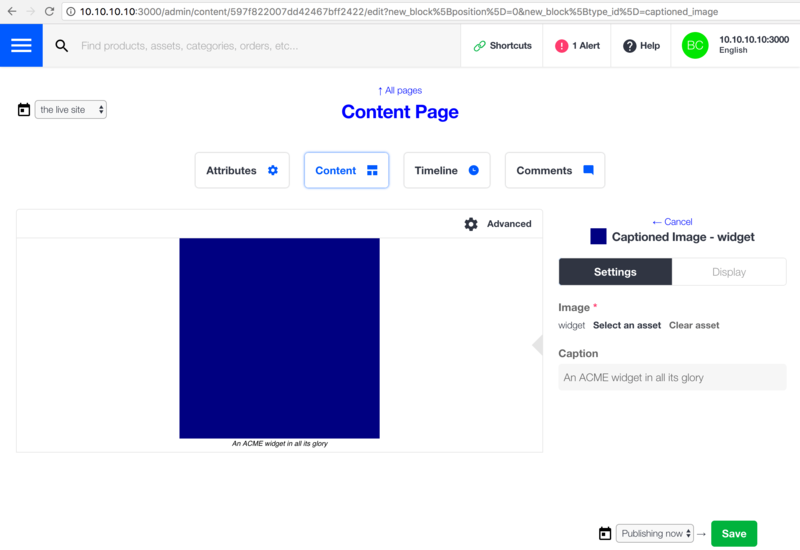 In this guide, I outline the steps for creating a content block type and provide an example for each. If your component requires assets, add them to your application at any path included in Rails.configuration.assets.paths. My example requires an image, which I add at the following path. You need a style guide to develop your component abstractly. To add a Storefront style guide, create a partial under app/views/workarea/storefront/style_guides/components/. Copy the style guide boilerplate from an existing Storefront style guide partial. Alternatively, use the workarea:style_guide Rails generator to create the file and the boilerplate. Add static content within the partial to represent your component. My example requires an image and a caption. Below is my partial. 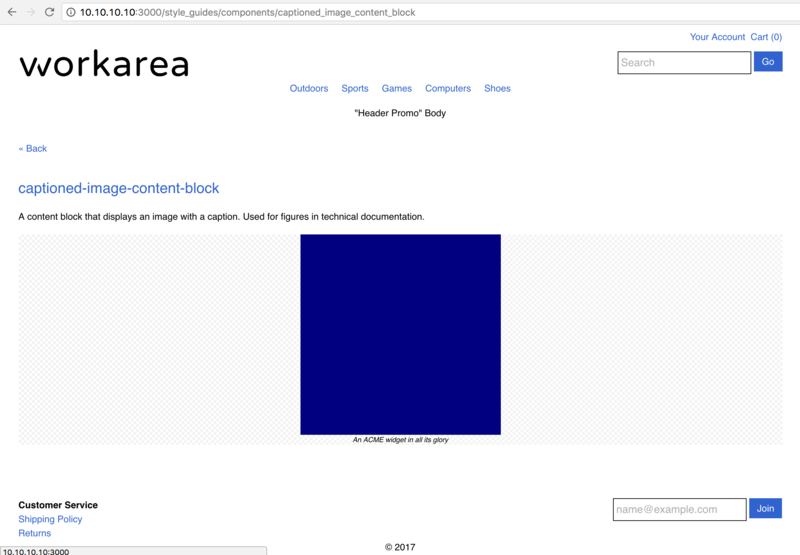 %p A content block that displays an image with a caption. Used for figures in technical documentation. If your component is stateful, add additional example blocks to document and test each state. 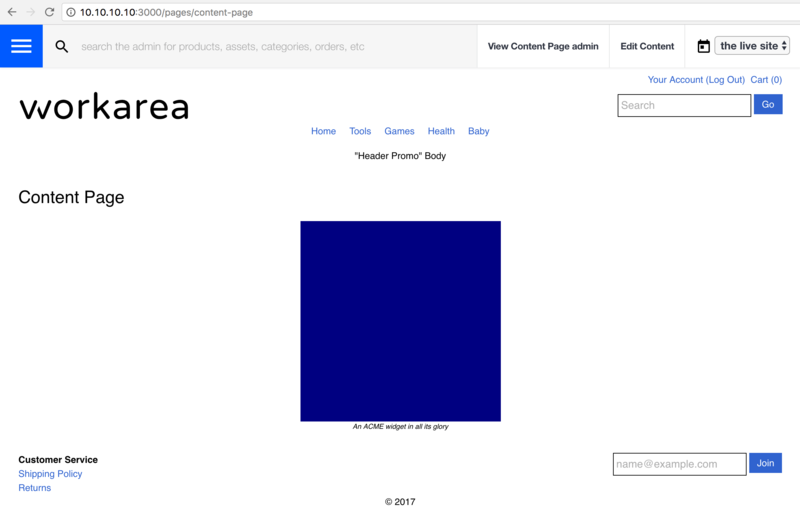 Next, add a stylesheet to style the component. My stylesheet follows. To include this Stylesheet, you must override or append to the Storefront stylesheet manifest. I create the following initializer to append my stylesheet. Now start your server and navigate to your component in your browser to test it. For example, my component is available at the following path. Creating the block type requires adding a block type definition via the content block DSL and adding a partial to render blocks of that type in the Storefront. You can optionally run the workarea:content_block_type Rails generator to create the boilerplate for these steps. Define your block type in an initializer. I like to start with a static block (no dynamic data) to confirm everything is working. My initializer is below. Create your Storefront partial under the directory app/views/workarea/storefront/content_blocks/. The file name must match the block type name for the partial to be found when rendering blocks of this type. For now, I copy the static example from my component style guide into the partial. Start your server and navigate to a content edit screen to add a new block. Your new block type is listed. Choosing that type renders your static content in the preview and offers the default display options for editing. Saving and navigating to that content in the Storefront renders your static content. To provide a custom Admin icon for your block type, create an SVG icon file that mimics the presentation and properties of those used by the default block types in the Admin. Save the icon under the directory app/assets/images/workarea/admin/content_block_types/. The file name must match your block type name. For my example, I add an icon at the following path. Within the Admin, add a new block to confirm the icon is displaying correctly. To finish the block type, you must replace the static content with dynamic data. This requires adding fields to the block type definition, providing default data for those fields, and outputting the field data in the Storefront partial (often using a Storefront view model to manipulate the data first). My example uses Image and Caption fields, as shown below. If the default values for your fields require data (products, assets, etc), add seeds for that data. My example requires a content asset, so I add the following seeds file. And I add an initializer to update the list of seeds. If you need to manipulate data values before displaying them, add a Storefront view model for your block type. Create the view model under the directory app/view_models/workarea/storefront/content_blocks/. The file name must match your block type name. For my example, I need to convert the content asset instance stored in data[:image] into an image path. I therefore create the following view model. As a convenience, I also add the caption method which simply passes through the value of data[:caption]. Finally, update your Storefront partial, replacing static content with data from the view model. My updated partial follows. You can confirm your block type is working by creating a new block of this type in the Admin and viewing the result in the Storefront. I did not write any automated tests for my example because its functionality is covered by existing platform tests. However, you may need to write a view model test and a system test if your block type includes logic or UI features that are more complex than my example. I designed my icon to stand out in screenshots. Your icon should more closely match the existing icons. Workarea 3.1 adds Workarea::Content::AssetLookup::find_asset_id_by_file_name, so if you are targeting this version of Workarea, you can use find_asset_id_by_file_name and avoid the need to implement find_asset_id as shown in my examples.